Hi there! How are you? This easy and quick to make sweet dessert is to help keep you cool during those days where you feel like you’re melting in the sweltering heat. It’s full of soft and creamy real cherry flavour and crunchy chocolate chips! 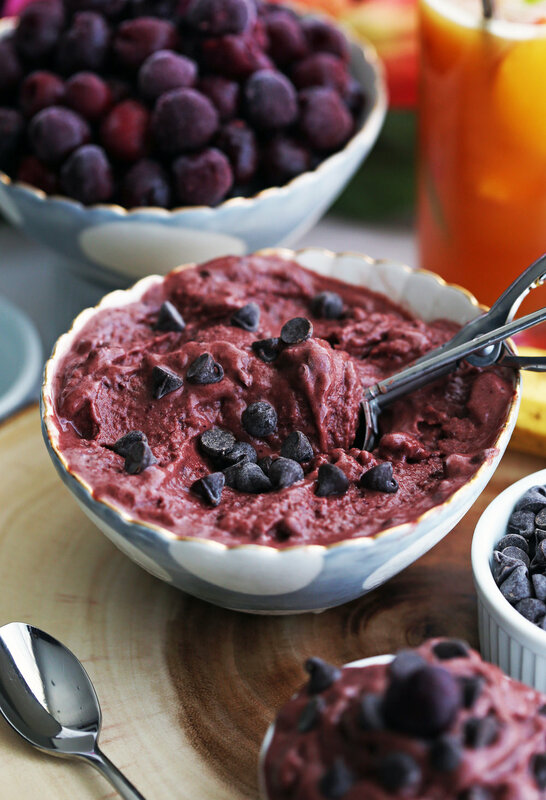 I hope you enjoy this delicious summertime dessert: Cherry Chocolate Frozen Yogurt! Place all the ingredients (except the chocolate chips) in a food processor fitted with the S-shaped blade. Full ingredients and instructions listed in the recipe card down below. Blend the ingredients until creamy. Then pulse in the chocolate chips. Serve immediately or place in an airtight container and freeze for later. This easy dessert has only five ingredients! During the summertime, cherries are finally in season and abundant to buy fresh from the grocery store or farmer’s market. From there you can pit them and freeze them. However, you’ll probably get a bigger bang for your buck (so much cheaper) if you head to the freezer section of the grocery store and buy frozen pitted cherries in a sealed bag. They tend to be available year-round too (as opposed to fresh ones). Another inexpensive option is to go cherry-picking (if you have the option and the time). We have a local berry-picking farm where we like to go and pick cherries off the tree for a small fee. It’s fun and I find it relaxing as you can kind of shut off your brain and just pick away, but it does take time. Frozen bananas: Bananas are sweet, soft, and inexpensive. I like to let bananas ripen on the countertop so the bananas are nice and sweet before freezing. Make sure you peel the bananas and seal them in a freezer bag or container prior to freezing. It is so hard to peel a frozen banana. Check out these recipes using Greek yogurt! Chocolate chips: Okay, I’ll admit it. I do snack on chocolate chips regularly. While the cherries and bananas give this treat a natural sweetness, the additional chocolate chips have that addictive sweet chocolate flavour (I use semi-sweet) and it’s crunchy texture contrasts wonderfully to the creamy frozen yogurt. Cocoa powder: It gives a hint of chocolatey flavour to the cherry frozen yogurt. Delicious: full of wonderful cherry and chocolate flavours. Refreshing and perfect to have on a hot day. Super quick and easy to make: It takes around five minutes to make in a food processor. It's no-churn so you don't need an ice cream maker too. Easy to adapt: Swap out frozen cherries with another frozen fruit or mixed berry fruit blend. A healthier alternative to regular ice cream: It’s made with fat-free Greek yogurt instead of heavy cream. Ready to be served immediately or saved for later: You can enjoy it right away for a soft serve texture or it can be frozen for a longer period of time for a harder consistency. Looking for more no-bake desserts? Place all the ingredients except the chocolate chips in a food processor fitted with an S-shaped blade. Blend until smooth and creamy, pausing to scrape down the sides of the food processor if necessary. Add in the chocolate chips and pulse until they are distributed throughout. The more you pulse, the smaller the chocolate chips will break down. Serve immediately for soft serve frozen yogurt. For a firmer consistency, place the frozen yogurt in an airtight container and freeze for 1½ - 2 hours. For a hard ice cream consistency, freeze between 4-6 hours. If you freeze the frozen yogurt for a longer period of time (e.g. overnight), it will be frozen solid. Allow 10-20 minutes for it to thaw slightly before enjoying.